However, this policy does not hold while I am here in Italy on vacation. Part of the reason for my change in policy is that here I have reading time to spare (see my prior post). In my normal life I save all my reading time for books, not newspapers, not even book reviews, and I watch virtually no TV to boot (although I would if I had more time for it). But even more, the variation in my habits is due to the charm and interest of the papers I can get here. 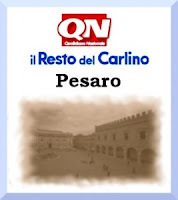 The local paper, called Il Resto del Carlino, (adorably meaning it costs only the change from an old coin: the Carlino) covers the world, of course, but it also has about 4 or 5 pages covering Pesaro, plus 1 or 2 covering each of the smaller nearby towns we also know well, like Fano and Urbino. The stories are of genuine local interest: lost cats, dogs improperly brought to the beach, numbers of people admitted to the local hospital during a heat emergency, events in the piazza, a daily feature on “the cute girl under the next umbrella”. I always look for people I know, or know of, and I often find someone. I also love, but LOVE to read the weekend edition of the International Herald Tribune. The news of the world is presented thoughtfully and yet the paper is kept short not by shortening the articles or making them graphic (in fact, the exact opposite of USA Today, which I enjoy reading when I am in the US for those differentiating reasons), but by lengthening the analysis on only the most important stories. Plus, I love the arts coverage, which always makes me long to catch the current big show in Bruges, or Tokyo. And, best of all, it carries the Sunday New York Times Crossword puzzle, to my mind the only crossword puzzle worth doing. None of this is stale-dated, so if it takes me until Wednesday to get to it, all 20 or so pages are still of deep interest. Can you tell I am writing this on Saturday morning, just waiting to pick it up and start reading it? I am just finishing an article from last week about the divide between opera and musicals and attempts made to bridge the gap. Isn’t that something I could easily think about and write up myself? Ahhh! Vacation bliss. Thanks for the idea, Rob!